As the centenary of the 1916 Rising is being commemorated, it seems fitting to post up a copy of the booklet produced to mark the fiftieth anniversary in Belfast. Ostensibly, the booklet was one of two produced to raise funds on behalf of the National Graves Association in Belfast and defray the cost of erecting the County Antrim Memorial on the Tom Williams plot in Milltown Cemetery. In the 1950s and 1960s, Jimmy Steele had edited a number of versions of what is now Belfast Graves, a compendium of biographies of republicans who had died while actively involved in various campaigns. The book represents one dimension of republican commemoration and remembrance that also included poetry and songs, physical monuments, occasionally, but rarely, buildings (such as Pearse Hall) and equally significant but less tangible memorials such as naming GAA clubs, pipe bands and cultural organizations after key individuals. Commemoration, as a theme, provides a window on the wider republican communities, often reflecting the degrees of division and fragmentation. Noticeably, the singular focus that the Twelfth gives unionism is absent in republican commemoration despite a generally agreed pantheon from Tone to Connolly. This autonomy and independence in commemoration is arguably integral or a function of revolutionary organizations that espouse republican equality as opposed to monarchy (although the depth of antagonism often shown is deeply unproductive, except to opponents of republicanism, and needs to be overcome some way if republican ideals are to be realised). Physical monuments, up to the 1970s, were largely confined to the republican plots at Milltown with their representative, but by no means comprehensive, listings of the dead. The incompleteness and ambiguity of the original lists on the County Antrim Memorial in Milltown belies any idea that republicanism is overly obsessed with history (otherwise the monument would be informed by painstaking detail of all relevant dead, with correct dates, etc). But, in reality, some dead are listed there to remind republicans of a common purpose and to deter the faint-hearted. One message, also found in songs and poems, is clearly that to participate is to risk death, usually misinterpreted as glorifying ‘sacrifice’, when possibly the opposite is intended – it is to put off those who may succumb to treachery to avoid that ‘sacrifice’. The location, in a Catholic cemetery at Milltown, does clash with the idealism of secular republicanism but is possibly the only physical space which unionism would concede for such a purpose (as it conveniently allows unionism to Catholicise it to fit its own narrative). Notably, McArts Fort on Cavehill was the venue of choice until the 1920s (revived temporarily in the 1960s). That said, Belfast and Nineteen Sixteen, for its era, overcame many of these issues. It includes republican and left republican voices, both male and female, and originating within and outside the contemporary republican movement. It also encompassed those who supported and opposed the Treaty in the 1920s. 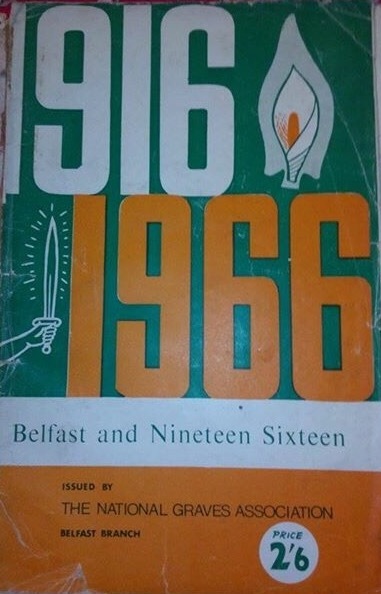 Contributions to Belfast and Nineteen Sixteen included articles by Cathal O’Shannon, Dennis McCullough, Nora Connolly O’Brien, Joe McGurk, Liam Gaynor and Steele himself. An additional item was an older piece about James Connolly written by Constance De Markievicz. It also contained poems and songs by Steele, Francis O’Grady and Cathal O’Shannon. McCullough had been President of the Military Council of the IRB and local commandant in Belfast in 1916. He had also been a key figure in various IRA veteran organisations that were dominated by supporters of the Treaty. O’Shannon was a prominent Labour activist. Their collaboration in the book signalled a broad rapprochement across various strands of the left and republicanism. Connolly O’Brien’s contribution reflected on the key role the women of Cumann na mBan played in 1916. This entry was posted in 1910s, 1960s, Uncategorized and tagged commemoration, County Antrim Memorial, Easter Rising, Milltown. Bookmark the permalink. I still have our family’s copy of this book and treasure it still.